The only constant in the mountains is change, and alpine light is the epitome of variability — one minute everything is cast in gold, the next it’s obscured by clouds. Later this year, Giro is releasing its Contact Goggle. The 2015/16 product has a new kind of interchangeable lens system that allows a user to swap out lenses to match the conditions on the mountain. Each lens has six magnetic strips that tightly secure the shield to the goggle frame. A button above the right brow depresses a locking hook, after which the magnetic tabs can be pulled apart, releasing the Zeiss lens. We got an early peek at the Contacts this week and liked what we saw. 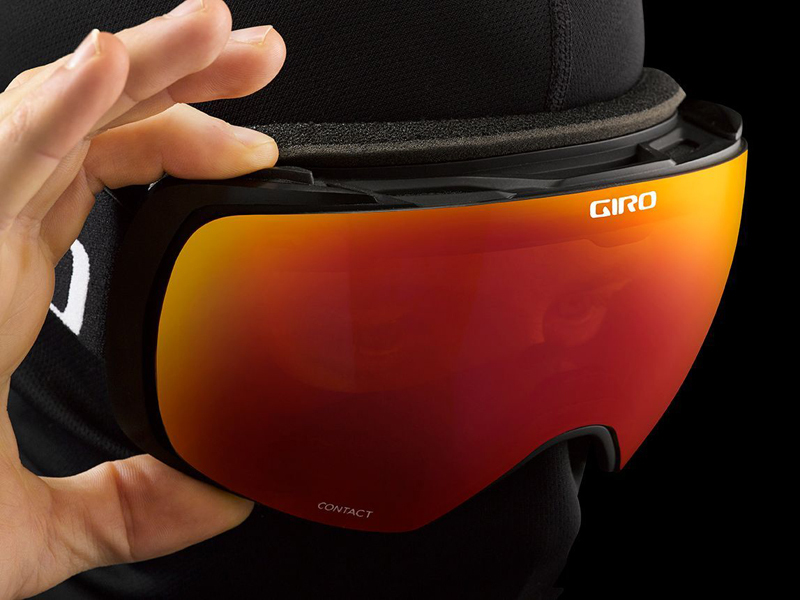 The goggles sit flush with Giro’s helmet line and provide an uninterrupted wide view. The magnets secure the lens tight with the face mask but naturally slip back into a locked position. The Contact goggles aren’t cheap — the base model will run $240 with two lenses to pair with full-sun or low-light. $300 will upgrade one of those to a polarized lens. Look for the Contacts to hit stores in August, a few months before you’ll need to gear up for the variable light of the coming ski season.